The Pressure Storm Series 2100-PSI 1.85-GPM Recoil Start Gas Pressure Washer is light weight at only 32 lbs but packs the cleaning power that the electric don't have. This pressure washer produces 2100 PSI and 1.85 Gal. per Minute of water with its Premium Anno Reverberi RPV Axial Cam pump. Includes a 16 in. gun and lance and has a 25 ft. PVC high pressure hose with included connectors. It features a wand storage on the frame for user convenience. Convenient handle and light weight for easy portability. Great for all your cleaning needs, patios, decks, fences, house siding, or your automobile or recreational vehicles. All parts to maintain and repair this pump are available. 3 Year Limited Consumer Warranty. The Pressure Storm Series 3300 PSI 2.5 GPM Recoil Start Gas Pressure Washer comes with a 7 HP 212cc engine with a 3.8 L fuel capacity and low-oil shutdown for protection. This pressure washer produces 3300 PSI and 2.5 GPM of water with its premium anno reverberi RMV axial cam pump. It includes a 16-inch gun and lance and has a 25 ft. PVC high-pressure hose with included connectors. It also features a hose hanger and wand support on the frame for convenience. With the panel-mounted controls, everything is at your fingertips: engine switch, push/pull choke lever and both inlet and outlet water connections. This consumer duty pressure washer features a 1-inch heavy duty roll cage frame with extra wide, anti-vibration pneumatic tires measuring 10-inch x 3-inch for easy mobility. The handle locks in the upright position while in use and can fold down for easy storage. This design is great for all your cleaning needs including patios, decks, fences, house siding or your automobile or recreational vehicles. All parts to maintain and repair this pump are available. 10-inch Surface, Deck and Patio Cleaning Attachment For SPX Series Pressure Washers The SPX-PCA10 deep cleans with ease and saves time too. 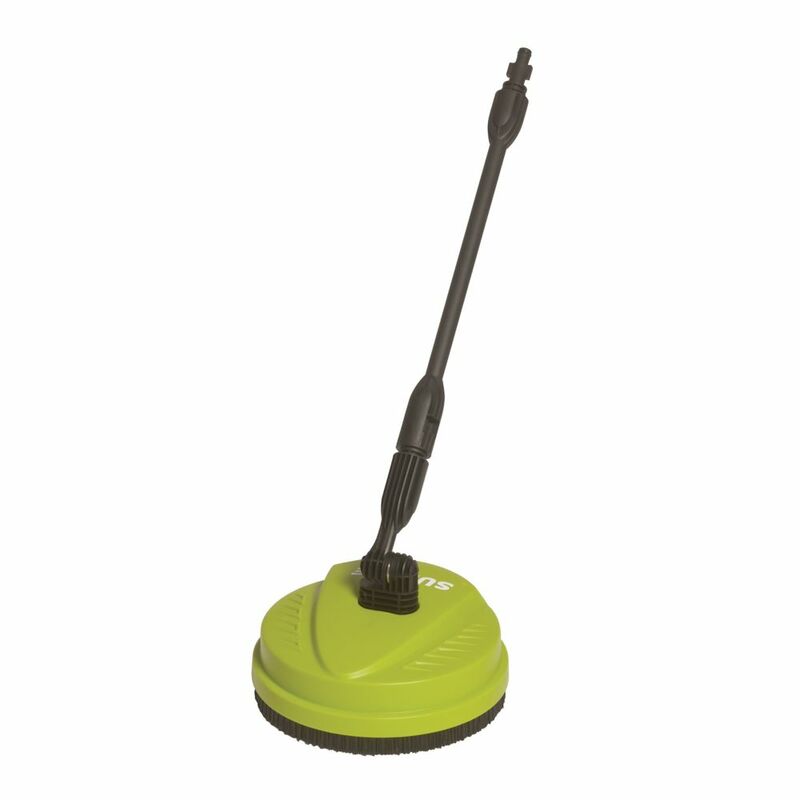 The attachment is ideal for an endless array of cleaning projects - from porch to patio, driveways and decks, boats, pavers, bricks, BBQs and more. This durable, multi-purpose brush loosens grime, dirt and debris. 10-inch Surface, Deck and Patio Cleaning Attachment For SPX Series Pressure Washers is rated 3.7 out of 5 by 114. Rated 4 out of 5 by Chris from Works great!! Made a lil cheap though. ... Works great!! Made a lil cheap though. Rated 5 out of 5 by HankP from pleasantly surprised Considering the price and first impression when I saw it. It works amazingly well. I would recommend it to friends. Rated 4 out of 5 by Mioxford from A little hard to use as the push pull method does not work well, the head flips up. If you hold t... A little hard to use as the push pull method does not work well, the head flips up. If you hold the shaft vertical and push lightly the head does not tend to want to flip up. Other than that issue the attachment works well and cleaned a very dirty deck. Rated 5 out of 5 by aje3892 from This cleaner is a DIY tool for a casual weekend warrior. We paid a guy $125 to clean our drivewa... This cleaner is a DIY tool for a casual weekend warrior. We paid a guy $125 to clean our driveway before listing our house for sale last year. He had better equipment, however I thought I would invest that money in a pressure washer and surface cleaner and do it myself at the new house. The surface cleaner works great with the SPX4000, I did our driveway (13m x 5m) in 2.5 hours, my 9 year old even gave it a try and was successful at cleaning a 1m x 1m spot without getting too wet. My driveway was very dirty. I blew it off with a 15 degree nozzle to get rid of stones and nuts, then used the cleaning attachment left to right to loosen most of the dirt, then would go perpendicular at a slower speed to get all the dirt off and remove the swirl marks. Using this was a little less painful than the wand, I'm not sure which is faster however this was more fun and idiot proof. It lasted for the 2.5 hours without breaking. I have a cement mailbox path, brick steps and a deck to do still. This should make it easier. Rated 5 out of 5 by Oliver from I used this once to clean my back patio. It really helps limit the amount of dirt and debris that... I used this once to clean my back patio. It really helps limit the amount of dirt and debris that is thrown up during the cleaning (both on yourself and the siding of the house...) I did find that if I pushed down too hard it was difficult to move it around without it tipping up (as other reviews have noted.) But by more letting it rest on the surface of the patio it stopped tipping. My only negative is that I'm 6'3" and after a while my back was aching from bending over while using it. So if it was a little longer I think that'd be good for me. I wouldn't want to clean my patio without it as it really does prevent a lot of dirt from getting onto everything around the patio. Rated 4 out of 5 by Elsa from My first impression was not very good. It comes with no usage instructions but many people thoug... My first impression was not very good. It comes with no usage instructions but many people thought this was great so I figured I was missing something. This product works best on pavement if it either does NOT touch the surface or extremely GENTLY glides across the surface. If you try and push it or pull it along the surface with any pressure it does not work well and will leave you frustrated and very wet. My first attempt with it, left me wet and unsatisfied but after realizing it is intended to be elevated slightly from the surface I found it very quickly cleaned areas and did a quite nice job. Well worth the money. I wish it was a quick connect attachment instead but it is not complicated to swap out the wand on the gun for this attachment. Does it include the long attachment?